The Library Company of Philadelphia's Jennings Photograph Collection was acquired in two accessions, one in 1978 and the other in 1981. The collection is comprised of more than 1400 eight-by-ten inch negatives and prints that illustrate the Philadelphia region in the late 19th and early 20th-centuries. 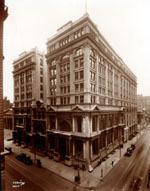 The Jennings Photograph Collection records Philadelphia's architectural and technological progress in the late nineteenth and early twentieth centuries. His photographs provide a modern image of Philadelphia that counter the city's reputation as a "quaint maze of ancient brick and cobblestones." Railroad stations, construction sites and streetviews in and around the Philadelphia region appear repeatedly along with new building forms, especially the new steel and masonry towers hovering over the old rows in downtown Philadelphia. 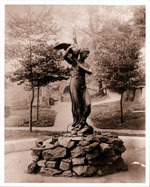 In the early twentieth century, Jennings free-lanced for several newspapers, including the North American, the Philadelphia Inquirer and Leslie's Weekly and opened a small photographic studio taking post card photographs of Willow Grove Park and Philadelphia events, such as the Sesquicentennial celebration in 1926. 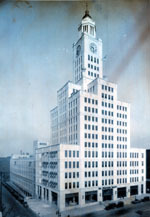 Throughout his career as a photographer, Jennings used the camera as a scientific tool to capture the form of lightning and to provide visual documentation of the city's growth. He was the first photographer to take clear, aerial photographs of Philadelphia from an air balloon with Samuel Archer King in 1893. 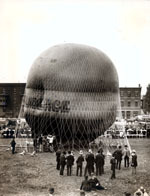 The city's changing streets and buildings along with its grid planning are depicted in these balloon photographs. 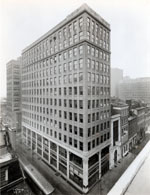 Many of his images of street views and new buildings in Philadelphia appear to have been shot from the top of other buildings, which allowed for a clearer, direct view of the sites. Structural form, rather than the hustle and bustle of street life, dominate his views of Philadelphia. 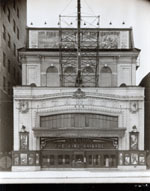 The following index of the Jennings Photograph Collection is organized by subject category. The number of photographs within each category are listed to the right of the subject heading in parentheses. Each of the subject headings links to another page that will provide specific information about each photograph. The title of each photograph was supplied by the Library Company since Jennings titles were not always complete. If you are searching for a specific subject or word, you can perform a full text search on any of these subject pages or the full index page. Entries in blue indicate that a scanned image has been linked to the title. For more information about specific photographs in the collection, enter any information supplied in the index into WolfPac, the Library Company's search engine. Or contact the Print Department of the Library Company of Philadelphia.